At Urban Escape, our mission is to achieve a new standard for dedication and commitment in the beauty industry. Our professional & highly skilled team provides an environment of hairdressing excellence where the happiness of our salon guests is our highest priority. We are committed to treating each guest with personal care and consideration, listening to your needs and responding professionally. 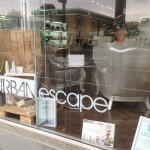 At Urban Escape we believe in caring for the environment and the world we each share by using renewable resources & products free of synthetic ingredients or petrochemicals. We welcome you to come & experience a sensory journey of relaxation away from the outside world.